Cayetano Pérez, general chief [leader] of the Ye'kuana and Sanumá people clearly expresses his opinion regarding the indigenous people who practice mining. “I have not given them permission to mine. Some of us have become corrupted [working in the mines]. Mining is not our job. […We] are acting wickedly, mistreating our brothers. Photo: Minerva Vitti. It is Saturday night in El Playón. The Ye’kuana and Sanumá people are gathered inside the Öttö, a circular communal house, waiting for the representatives from the Venezuelan government. These people come from 24 of the 49 tribal communities located along the Caura River, a tributary of the Orinoco River in southern Venezuela, and they have been summoned for the 20th Assembly of the indigenous association Kuyujani Organization. They have already been talking for almost four days, discussing the problems that are currently affecting them within their ancestral home. The issue that concerns them the most is the creation of a National Strategic Development Zone along the Orinoco River and the threat it represents to them and their land. This new national zone comprises an area of 111,843.70 square kilometers, which is the equivalent of 12% of Venezuela’s national land. The Venezuelan government maintains that the Arco Minero project that would take place here could be the answer to the country’s out-of-control economic crisis (due to the fall in prices for petroleum). To authorities, that justifies any potential problems it will create for the locals — the needs of the many should outweigh the needs of a few. But this would not be the indigenous communities’ first experience with mining. In fact, it is their past experiences that make them wary. As you travel down the Caura River — which is the third most important river in Venezuela due to its vast richness and the second main tributary of the Orinoco River — you’ll see the Criollos, Ye’kuana, Sanumá, Piapoco, Kurripaco, Pemon, and Jivi (or Guahibo) tribes that live along the waterway in villages like Payaraima, Puerto Cabello, Las Trincheras, La Poncha, La Ceiba, La Fortuna, Boca de Ninchare, and Surapire. You’ll also notice small mining excavations along with different people – both indigenous and non-indigenous – removing bits of earth and water with their trays in order to see if they can find any grams of gold. Mining activity has left its mark. “All of the water from the Caura is contaminated,” says Saúl López, an indigenous speaker and member of the Kuyujani Organization, referring to a study that the organization helped the La Salle Foundation and the Universidad de Oriente perform between 2011 and 2012 in which high levels of mercury were found in Ye’kuana women. There’s even more concern because of illegal mining, which began here in 2002 but worsened in 2006. At the time, it was thought that the river would need more than 200 years to fully recover. At first, the Kuyujani Organization asked for governmental aid, thinking that the government could help them tackle the issue. It created two projects: mining reconversion, to reconvert miners to other trades, and the Caura Plan, implemented in 2010 in order to stop the environmental devastation generated by illegal mining in the Caura River’s basin. The Caura Plan was initially conceived to work holistically in three ways: socially, politically, and militarily. With this plan came three military checkpoints, but those ended up metamorphosing into a business for the military; one that didn’t help the indigenous peoples, but instead caused them more problems. The indigenous communities now had to pay a “vacuna,” or sums of money, in order to guarantee that they wouldn’t be attacked. At the checkpoints, people were intimidated, and the military took whatever they wanted from those trying to enter the local communities. “No payment, no pass,” they said. Some members of the communities responded by detaining an army commander in charge of the checkpoints and demanding that the government’s representatives do something about the constant abuses coming from mining as well as the governmental oversight. As a result, one of the checkpoints was removed, but two others remain, and they still charge people to let them bring food to the mining areas. The communities also had to deal with the “labor unions” that entered the area with the miners. The situation is complex, as these “labor unions” are actually criminal bands that control the local mining activity. Their union names have no relation at all to the original organizations that laborers created to defend their interests. The locals are afraid of reporting these unions to those outside of the communities due to the possibility of union retaliation: “They have already done that to the Criollos,” says one Ye’kuana man. And now, the Arco Minero project advances towards these lands. 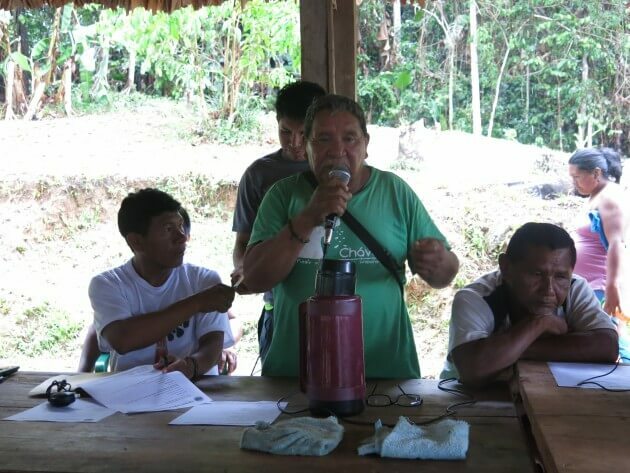 During a meeting with government officials, among whom were representatives from the Department for Indigenous Peoples, the necessity of carrying out the mining project was explained to the indigenous communities. Numerous rights were overlooked, whereas the locals’ duties were emphasized. The exploration groups are already en route, some of them working in alliance with businesses from the People’s Republic of China, such as Citic Group. No private, labor-union, association or group union interests, or rules, will prevail over the general interest in the fulfillment of the objective content of the present decree. Individuals who execute or promote material interventions [activities that obstruct] regarding partial or complete operations of productive activities of the strategic development zone created in this decree will be penalized in accordance with the applicable legal code of laws. The security organisms of the [state] will carry out the immediate, necessary actions in order to safeguard the normal development of the planned activities in the Plans for the National Strategic Development Zone for the Arco Minero of the Orinoco River, according to the implementation as provided in this article. With this decree, illegal mining in the Caura becomes legalized. Now they are definitely going to kill us. Why not first resolve the illegal mining problem before making another project? What is going to happen with that? In the meeting, the government’s representatives emphasized the resources that could be of use to the country; however, they did not mention that the Venezuelan government cannot promote mining projects without first going through the preliminary consultation processes, which must be free and informed, with the indigenous communities. Neither did they name the 150 national and international business that exploit the resources in indigenous territories, nor mention that two weeks before the April decree Venezuela’s President Nicolás Maduro announced the creation of the Anonymous Military Company of Mining, Oil, and Gas Industries (also known as CAMIMPEG in Spanish) and assigned it to the Ministry of Defense, vesting the department with a wide spectrum of powers for pursuing “without any limitation” any activity directly or indirectly related to mining, oil, or gas activities. In any case, the Armed Forces will not represent the “general interest” in the zone, but rather will have a direct economic interest for ensuring the mining activities do not encounter any obstacles. Our territory is the strategic site where there are minerals, the government knows this and because of this is watching us. We are in our ancestral territory, our own, our history tells us this is so. How can we culturally coexist with the West? […] How can we be in contact without the other culture harming us? If we divide ourselves, we weaken our fight and those coming from the outside, with a colonial thinking, will cause us harm. We are growing too accustomed [to this], and also have to stop the Ye’kuana traders. We have social statutes that are focused on environmental preservation and conservation. If we practice mining, we are desecrating ourselves. Despite all of the pressure coming from both indigenous and non-indigenous organizations, Venezuela’s Vice President Jorge Arreaza announced on August 3 that a total of 181 indigenous communities have signed onto the projects that will be encouraged through the National Strategic Development Zone for the Arco Minero of the Orinoco River. On August 5, President Nicolás Maduro signed contracts with transnational companies valued at $4.5 million. “The Arco Minero is now a reality,” he declared. This Article is a condensed version of a report by Minerva Vitti, originally published by the Gumilla Center. It has been translated to English by Sara Holmes for GlobalVoices and re-published at IC under a Creative Commons License.